Home › Construction Spanish › Jobsite Leadership › George Carlin and Getting R.I.D. of E.M.R. George Carlin and Getting R.I.D. of E.M.R. Safety... Not a dirty word. Which of the following two questions do you prefer? What’s your corporate Experience Modification Rate? What’s your corporate Rate of Injury and Death? Are you a bigger fan of the first question – the obtuse one? Or are you a fan of the second – the direct one? Whichever you prefer – ask yourself Why? George Carlin would not have been a fan of Experience Modification Rate (EMR). Not the concept per se, but the name itself: Experience Modification Rate. What does that mean anyway? It’s a rate, a mathematical factor, that is modified by an experience. OK – that tells me nothing. What experience? It reeks of corporate business-speak. It’s the type of name that seems to be concealing something. Aha. The rate is modified by the claims experience. Experiencing a claim… huh? You experience a trip to Disney or food poisoning – not a claim. And a claim affecting your EMR is generated by what? An injury or death – that’s what. And here is where George Carlin would have gotten angry. He would have dropped any number of dirty words unacceptable for television. He would have gotten irate because Experience Modification Rating conceals the very nature of what it calculates – the rate with which workers are injured or killed doing a given job for a given company. Call it Experience Modification Rating and the definition – as understood by the managers and workers on the jobsite – gets muddled. A few managers and workers clearly understand, others kinda do, and others have no clue. The actuaries and guys and gals in the C-Suite know exactly what it means – they follow the money. If it affects the bottom line, the C-Suiters will know what it means. But what about those individuals on the jobsite actually doing the work? They should certainly know what it means, why it matters, and the effect it has, right? Call it Experience Modification Rate and the most common answer is, “Uh, I just know we are under 1.0.” Call it Rate of Injury and Death and I bet people will know exactly where it stands. I propose we banish “EMR” to the quants at the National Council on Compensation Insurance (NCCI), the ones doing the math. But on the jobsite and within the walls of your company, let’s start calling it the “R.I.D. Rate,” the Rate of Injury and Death. Calling it the R.I.D. Rate would lead directly to the conversation about what we’re actually getting rid of: Money, Productivity, Focus, Days on the schedule, and silence from OSHA. And let’s not forget some other things we’re ridding: – good workers and deep sleep for the families of the injured workers. Experience Modification Rating is a euphemism. It’s a phrase that distorts the truth of what it represents. It’s not anyone’s fault. It just is. So let’s change it. Let’s make our own Christmas Miracle this year. Right now. Let’s rid ourselves of Experience Modification Rating and start using Rate of Injury and Death – the RID Rate. Don’t underestimate the impact of the words we choose to use. Let’s get RID of EMR. If we reduce the Rate of Injury and Death on our jobsites, EVERYONE wins. Below is an excerpt from George Carlin’s rant on euphemisms from his Parental Advisory: Explicit Lyrics album. (Paragraph breaks and bolded text are mine.) 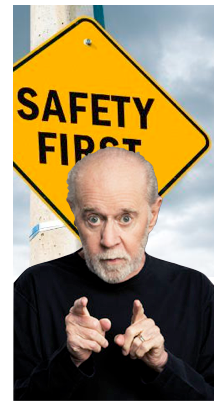 There are no explicit lyrics, but Carlin is speaking directly to the way we refer to injuries and death…. I don’t like words that hide the truth. I don’t like words that conceal reality. I don’t like euphemisms, or euphemistic language. And American English is loaded with euphemisms. ‘Cause Americans have a lot of trouble dealing with reality. Americans have trouble facing the truth, so they invent a kind of soft language to protect themselves from it, and it gets worse with every generation. For some reason, it just keeps getting worse. I’ll give you an example of that…. There’s a condition in combat. Most people know about it. It’s when a fighting person’s nervous system has been stressed to its absolute peak and maximum. Can’t take anymore input. The nervous system has either snapped or is about to snap. In the first world war, that condition was called Shell Shock. Simple, honest, direct language. Two syllables, Shell Shock. Almost sounds like the guns themselves. That was seventy years ago. Then a whole generation went by and the second world war came along and the very same combat condition was called Battle Fatigue. Four syllables now. Takes a little longer to say. Doesn’t seem to hurt as much. Fatigue is a nicer word than shock. Shell Shock! Battle Fatigue. Then we had the war in Korea, 1950. Madison Avenue was riding high by that time and the very same combat condition was called Operational Exhaustion. Hey, we’re up to eight syllables now! And the humanity has been squeezed completely out of the phrase. It’s totally sterile now. Operational Exhaustion. Sounds like something that might happen to your car. Then of course, came the war in Vietnam, which has only been over for about sixteen or seventeen years, and thanks to the lies and deceits surrounding that war, I guess it’s no surprise that the very same condition was called Post-traumatic Stress Disorder. Still eight syllables, but we’ve added a hyphen! And the pain is completely buried under jargon. Post-traumatic Stress Disorder. I’ll bet you if we’d have still been calling it shell shock, some of those Vietnam veterans might have gotten the attention they needed at the time. I’ll betcha. I’ll betcha. But… But, it didn’t happen, and one of the reasons… One of the reasons is because we were using that soft language. That language that takes the life out of life. And it is a function of time. It does keep getting worse. ‹ Goonies: Spanish at the Movies.